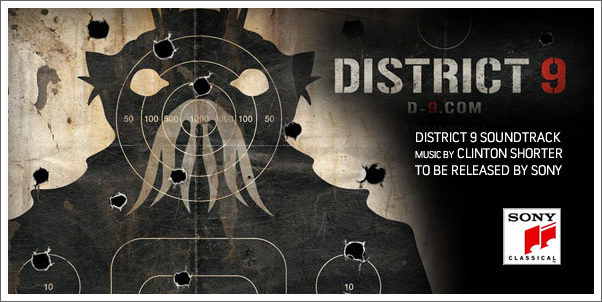 Tracksounds: District 9 Soundtrack to be released at Amazon and iTunes! District 9 Soundtrack to be released at Amazon and iTunes! During our interview with composer CLINTON SHORTER today, he confirmed that SONY would be releasing an official soundtrack containing his original score for the film DISTRICT 9. Having listened to the 10 track promo, I can say that his work is definitely worth a release. In the meantime, here is what CLINTON SHORTER said regarding the release. Be sure to look for our full podcast interview and transcribed interview in just a couple of days! Tracksounds: You mentioned the word "album."... Is there something in the works that you can talk about? CLINTON SHORTER: Yes. Sony closed the deal on Friday of last week and hopefully, it's going to be available for pre-order on Amazon.com this Friday and on iTunes, mid to late next week.